Features members of avant-rock ensembles Tortoise and Isotope 217. The trio of Rob Mazurek (cornet), Chad Taylor (drums) and Noel Kupersmith(bass) are joined by guitarist Jeff Parker on a few tracks. Since recording Playground (Delmark 503), the Chicago Underground’s Delmark debut, the three year old outward-bound collective has garnered much critical and popular attention from audiences in the US, Canada and Europe. 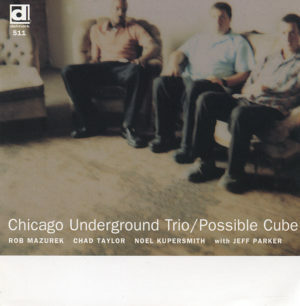 Possible Cubeis a continuation of the group’s ever-evolving sound that incorporates such disparate musical directions as post-bop, dub, free improvisation, electronic composition and world music. Recorded and mixed by Bundy K. Brown.